While the Smart is a road car, the Woodward Dream Cruise is definitely not where it was designed to travel. There is, however, a way to pull off the most unlikely trick of cruising in one here. You can show up at the Dream Cruise in a Smart Fortwo, but this is considered disrespectful to the audience’s eyesight. As the Smart is an order of magnitude smaller than anything out there on Woodward, the viewer’s eye has to perform constant adjustments to correct for the perspective. This strains the tiny muscles in the iris of the eye—the dilatator pupillæ and the sphincter pupillæ—which can cause discomfort. The considerate thing to do if you decide to cruise in a Smart is to cruise in a fleet of them. A line of Smarts will have a combined length comparable to a regular American muscle car, which allows for a more pleasant viewing experience from the curbs of Woodward Avenue. This is what Verizon has decided to do, sending out a fleet of Smarts. But secondly, you want to dress the Smarts up in something pleasing to the doughy and fleshy Americans watching the rolling Amerigasmic cruise. 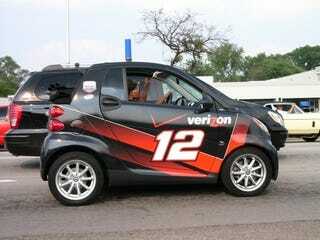 Which is why Verizon's Smarts are wearing the livery of Penske Racing’s NASCAR team, which it sponsors. In the name of every dilatator pupillæ and sphincter pupillæ muscle present, a hearty thank you to all involved. Keep a close eye on our Woodward Dream Cruise tag page for coverage all day!